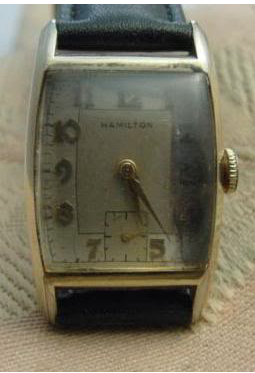 In 1950 Hamilton introduced the Austin. Produced for three years, the Austin was reissued in it's last year as the Austin B - although the catalogs don't list it as a B model. 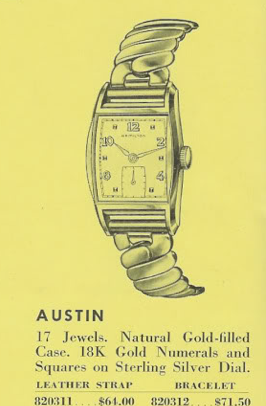 The original Austin had a two-tone dial as shown in this 1950 catalog snip. 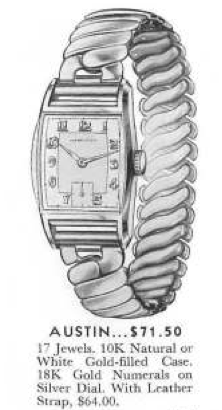 Then the 1952 catalog shows the Austin without the rectangular area and with markers as well as numerals on the dial. The Austin utilized the 14/0 sized, 17 jewel 980 movement. The Austin B used the 12/0 sized, 17 jewel 752 movement introduced in 1952. Since the movements are different, the case backs are different. The dials are also not interchangeable. However the crystals are the same as are the other general dimensions of the case. And here is an Austin-B that I used to have. I sold it as I think the Austin B is a little boring compared to it's older sibling. 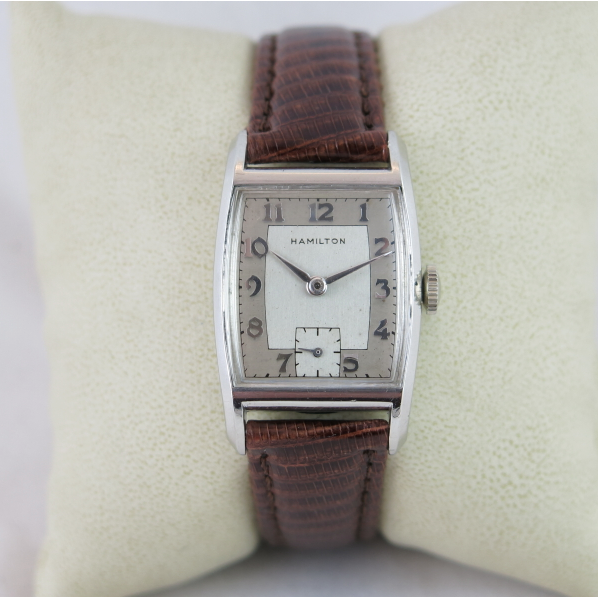 The Austin is also one of several watches in the early 1950's that was available in both yellow and white gold filled. Here's an example of the white Austin. It's not shown in the 1949 catalog, or 48 for that matter. I think the model years were like cars... the next year's models showed up in the Fall. So it's possible the 1950 Austin was on scene in late 1949 but it's not a 49 model, per se. The one on eBay isn't quite right... it's a white Austin case with a yellow Austin dial being passed off as "original". Was the Austin ever made with a black dial face. Not that I'm aware of. 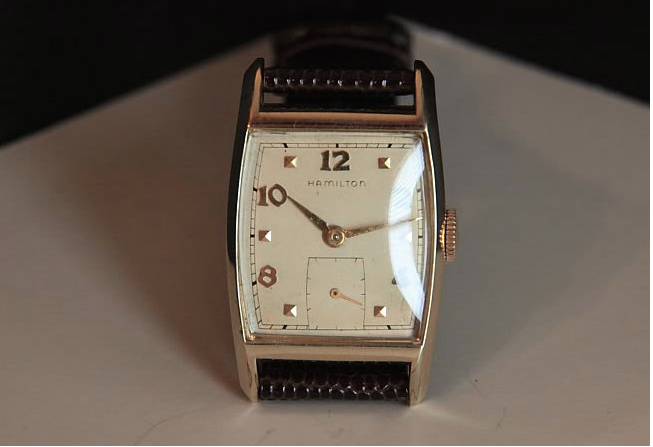 Other models did, like the Medford, but the Austin only had white dials with rhodium plated numerals for the white GF case. Dan, this restoration of the Austin is terrific! I agree with you that its the sentimental value that counts. 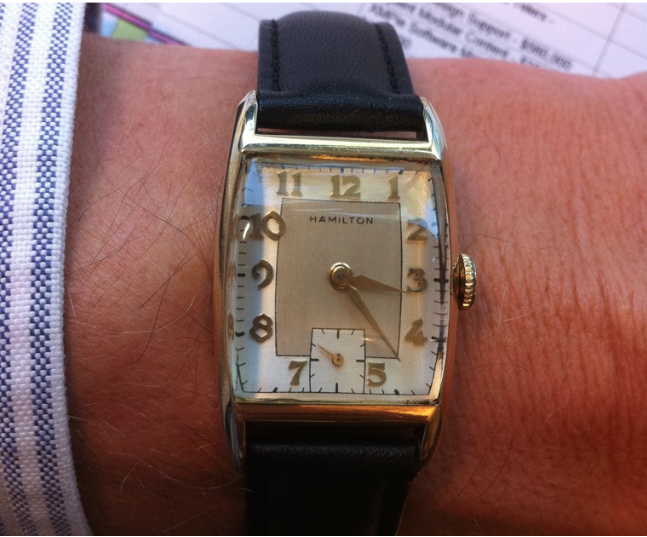 I only this week learned that the restored Hamilton that has been my every day watch for years is an Austin. I had it restored because it was my grandfather's watch, and the inscription indicates it was given to him for "five years continuous service without an automobile accident." I suspect they handed him the 1951 brochure and asked him to select one within the allotted budget and he picked the one bearing his nickname: Austin. Looking through hundreds of late 1940s and early 1950s catalogues to find the design I had a smiling "Aha moment" when I landed on the match. Thanks for sharing this.